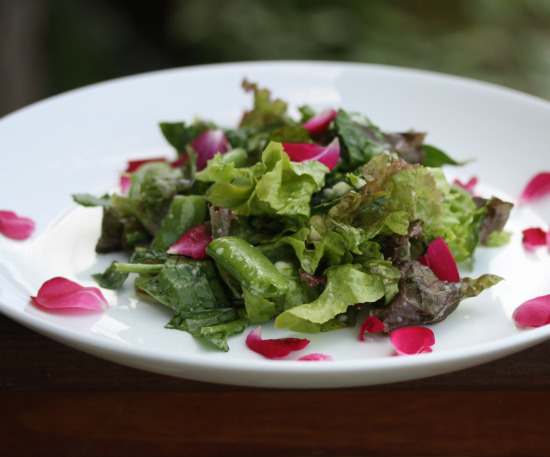 …everything for this Garden Pea and Rose Petal Salad came straight out of that happy garden! To make this salad I used a mixture of greens (green and red head lettuces, spinach, and an Asian green called purple pak choi), sliced peas, chopped basil, and it’s garnished with rose petals. Rose petals are indeed edible, but you should only eat them if they have not been sprayed with anything nasty (pesticides and such). How strong the flavor of the petals is really depends on how fragrant your roses are… I didn’t add a lot of them to the salad, just enough to give it some lovely color and a bit of their “rose-y” taste. I used a simple dressing featuring homemade yogurt and honey, and I dressed it pretty sparsely. I like how the slightly sweet dressing tempers the slightly bitter greens, but if you prefer a vinaigrette-style dressing, feel free to use that instead. Forgive me for listing the measurements in “handfuls”, but that’s how I usually do things when a recipe goes straight from the garden to the table. I’d estimate that one of my handfuls is approximately 1 cup. If you don’t have the specific ingredients listed here, don’t fret- this is an adaptable salad…just use what you’ve got. 1. Clean all of your greens very well and tear them into bite-sized pieces. 2. Chop up the basil and slice the peas. 3. in a medium bowl, mix together the greens, the basil and the sliced peas. Toss in a few rose petals, too, but keep most of them for garnish. 4. In a small bowl, whisk together the yogurt, the olive oil, the honey and the garlic. Pour over the salad and toss well. Garnish with the rest of the rose petals. This salad is linked to Real Food Wednesday over at Kelly the Kitchen Kop. What a fresh and beautiful salad. The rose petals are such a wonderful addition. This looks like such an elegant start to a summer meal. This seems way too beautiful to eat! Well, I guess that’s what photos are for; you can still enjoy the beauty AND the taste :) This seems like it would be a perfect dish for a fancy summer’s eve party too. I certainly “eat with my eyes” before I lift a fork. This salad looks smashing. Thanks. I LOVE flowers on salad! What a beautiful and I’m sure delicious salad. I am jealous of your garden! 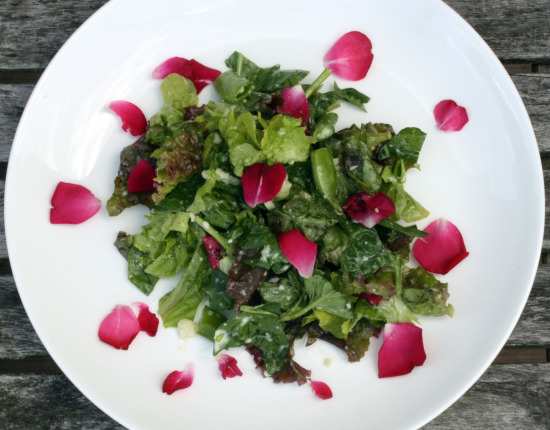 The rose petals looks like jewels on your beautiful salad. What a beautiful salad!! I am jealous of your purple bak choi… my regular bok choi didn’t do very well. Maybe I’ll try to find a purple variety for the autumn. What a lovely salad, great addition of the rose petals.. I like edible flowers on my salad too. Thank you for sharing. Enjoying your photos and recipes! I hold you personally responsible for the fact that I will now be stealing my neighbor’s roses, just so that I can have prettier salads! Beautiful to look and healthy to eat. Must make it. Big thumbs up. Gorgeous salad! I recently discovered rose petals at a dinner auction I was at. I didn’t realize we could eat these. Very appetizing salad. Thank you for the ideas. 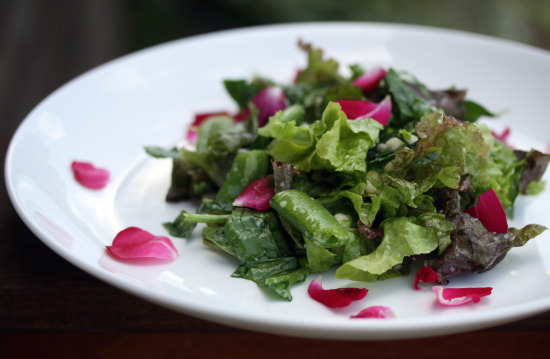 It looks absolutely gorgeous – I like the way the rose livens up the plate and adds floral notes to the salad. I’ve eating things with rose water, but never the actual petals!